Well i managed to fly it, got a bit low at one point but worked out OK in the end. Is there a leaderboard anywhere? Try the replay the race button. If you uploaded your own, you could include it. Hover the mouse of the barogram. Last edited by Skinny; 29-01-2019 at 15:09. I can see myself on there. I cant really see how I am rated on it. I guess as I was on my own and the conditions can change between attempts its difficult to measure my effort to those who did it faster before? Conditions are 100% identical (unless there is a flag set that randomizes the weather, which I did not set). Basically, you have to look at the speed of those that finished. Since this task was an "all planes" task, normally a handicap is applied depending on what glider you used. That handicap and the speed points you get is relative to the other competitors though, and speedpoints require a minimum number of competitors to finish the task. Therefore, if you races alone, or if you are the only one to finish you will get 826.4 points in that race, regardless if you did it in 30 minutes or 6 hours. Notice how Stefan Selker gets a higher score than Geir Waterloo, despite being a lot slower. Thats because the first flew in a standard cirrus, and the latter in a JS1-18m. Generally, the handicap factor is not enough to make up for "bad" planes below an index of 100-110. There is basically no chance in, say, a cirrus or Blanik to win on points against a modern standard or 15m plane even with the handicap. However, 18m and 21m is a different story. They have a higher index than 15m gliders, because they have a better L/D glide ratio. But in actual flight, that advantage shrinks as you fly faster (larger wings== more drag) and at very high speeds, a 15m Diana, helped by its exceptionally high wing loading, actually becomes as good or even better than most 18m gliders, yet it has a lower handicap. Long story short: Diana is the best plane for points in most fast task. its better than other 15m flapped gliders and at higher speeds performs similar to most 18m planes that have a significant handicap disadvantage. On slower ridge tasks, if you rarely fly over 200KmH, an LS-8 can be competitive too thanks to its lower handicap and quite good performance up to that speed. 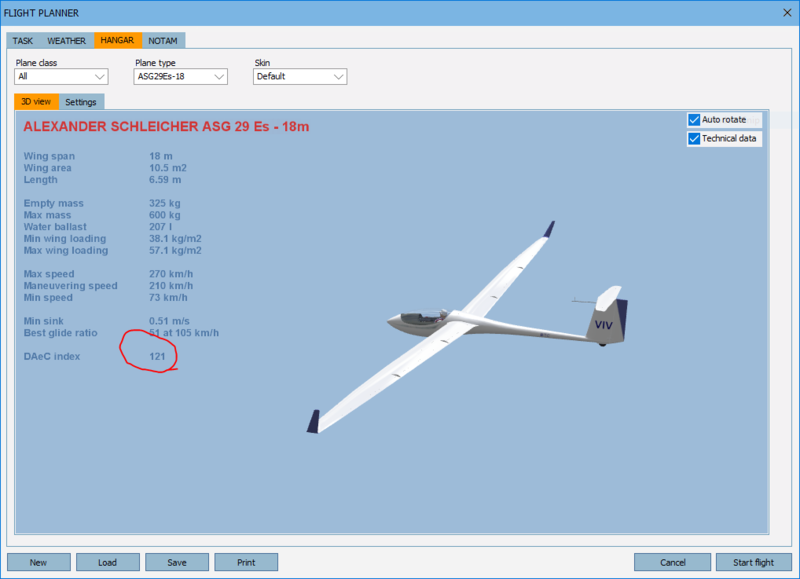 18/21m gliders perform better but can only compete on points in special conditions where the high glide ratio at modest speeds is actually useful, which is pretty rare, especially in condor. Note that in reality most competitions are flown in separate classes, so 18m dont compete with 15m or standard, and the handicaps are typically not used. They are mostly used in club competitions where only older planes with <100 handicap like a Cirrus/libelle/ls1 etc are allowed. Last edited by Skinny; 30-01-2019 at 20:30. I dont know how that works though. Maybe they do buy in bulk and get a discount, or its just a "pass through" where they collect a small fee on each sale? You could ask if you are interested. Now that you finished your first task, are you up for a proper first race? TchinTchin this evening 17:30 CET or 16:30 UK time I believe. You will need Jura Mont Blanc2 Scenery. Im uploading it now. Plane class is standard, it might not be a bad idea to buy the LS8 unless you are that one person who actually likes the Genesis, or you want to something to blame . couldnt do it sorry it was my sons birthday so we went out for a meal with the family.